The Citizens' Assembly meeting in Malahide, Co Dublin, has heard warnings from Met Éireann that the frequency of heavy rainfall events in Ireland is on course to increase by 30% while average summer temperatures could rise by 2C. The director-general of the Environmental Protection Agency Dr Laura Burke told the Assembly that climate change is the issue of our time, and that we need fundamental change across society to address the challenge. 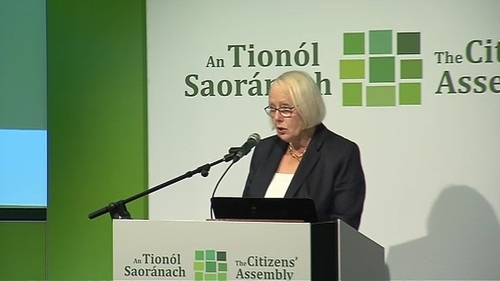 In her opening address to the 99 members of the Citizens' Assembly this morning, chairperson Mary Laffoy paid tribute to the 1,200 submissions on climate change received from members of the public. She said it was an unprecedented level of engagement on climate change in an Irish context and that the quality and range of submissions was very impressive. The Assembly listened today as expert after expert outlined to them the impact of climate change, the consequences if we do nothing about it, and the challenge Ireland now faces to live up to its responsibilities to tackle climate change. Joe Curtin, a member of the Climate Advisory Council, told the Assembly that Ireland is not doing its fair share and so far has failed spectacularly to achieve its climate targets. Dr Saji Varghese of Met Éireann outlined how surface temperatures in Ireland have already risen by 0.8°C and that figure could double by the middle of this century. He warned that the number of frost days could fall by 50%, that summer daytime temperatures could rise by 2C on average, and lowest night-time temperatures by 3C during the winter time. He said that large decreases in rainfall are also expected although the frequency of heavy rainfall events in Ireland such as the flash flooding that recently hit Donegal and the north-east is on course to rise by up to 30%. Professor Peter Stott of the UK Met Office drew a spontaneous round of applause from the Assembly when he said that if he could do just one thing in response to climate change it would be to remove government bureaucracy and red tape around energy efficiency and make It easier for people to access supports for installing solar panels, heat pumps, and other energy upgrades. Professor Stott outlined how relatively small amount of changes in temperatures can lead to very dramatic changes in extreme weather events and lead to flooding, heat-waves and other consequences. He outlined how 1C of global warming can lead to an increase of about 6% in the level of moisture in the atmosphere and that this moisture and heat then feeds into storms and leads to a greater incidence of rainfall. Environmental scientist Dr Conor Murphy outlined just how vulnerable Ireland is to the effects of climate change. He detailed the evidence of sea level increases, air and ocean temperature rises, and how evidence suggests that it is humans who are driving these changes. He said the hottest summer in Ireland over the past 100 years was in 1995, but that the chances of a summer that warm occurring again has increased dramatically over the past 20 years. He said the chances of an extremely wet winter such as that in 1994 and 1995 had also increased significantly. Environmental groups have labelled this weekend's gathering of the Citizens' Assembly as "a ground-breaking process in democratic decision making," where the members are learning about significant changes needed in Ireland's approach to tackling climate change.